UW alumna Susan Harris, ’15, spent a quarter studying everything from orcas to algae on the rocky shores of San Juan Island — right in the Puget Sound’s backyard. For the “ZooBots,” a quarter at the University of Washington means watching whales breach off the coast of San Juan Island, hiking through the old-growth forest, and taking a sunset row into Friday Harbor. It means lowering a dive light from the docks to see crabs crawling and sea lions swimming and jellyfish glowing in the moonlight, and having a bonfire with classmates who have quickly become like family. Named for the subjects they’re studying — zoology and botany — 17 undergraduate “ZooBots” spend their days traipsing around the UW’s Friday Harbor Laboratories (FHL) campus, which feels, in many ways, like “science camp for adults,” says Susan Harris, ’15. That “whole land” is nearly 2,000 acres of untouched biological preserve, to be exact. Untouched, that is, save for the small bundle of buildings that make up the College of the Environment’s facilities, which have been home to respected faculty and the world’s foremost researchers for more than a century. And, for 10 weeks a year, it’s home to aspiring students like Harris, who drive 80 miles from Seattle and hop a ferry to live, eat and work at the field station, which overlooks the bustling harbor. The suite of courses — two days of zoology, two days of botany, and Friday for independent research projects — is designed to give young scientists a crash course in marine biology. According to Harris, who studied fisheries, it delivers. “What’s really amazing about the structure of the quarter is we have a lecture on invertebrates or seaweed in the morning, and then we go straight to lab and see exactly what we just talked about,” she says. Better yet, the students are going to the field and collecting exactly what they just talked about. 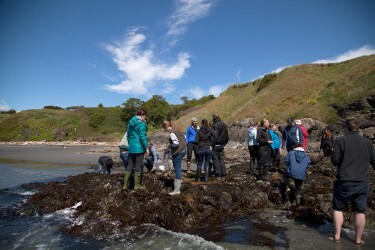 “A couple times a week, the class will take vans out to a different kind of rocky intertidal habitat or to a beach, and anything you can pick up, Professor Megan Dethier and Professor Tom Mumford — who are ecology lords — can tell you a story about,” says Harris. “Here, you’re taking what you’re studying from right there in front of you, right out of the ocean. It’s something that’s part of the UW that’s right in our backyard, and that’s rare,” says Harris of the hands-on learning experience.